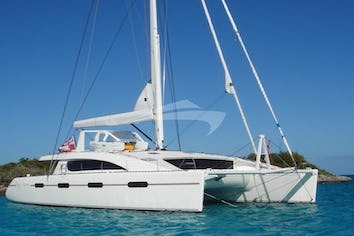 19TH HOLE is an exceptional Sunreef 74 sailing catamaran equipped to the highest of standards. With a cutting-edge design maximized for space, comfort, and performance, this impeccable beauty stands out both in her modern and sleek style and her outstanding liveability. For a luxurious yachting holiday in the Caribbean or the Mediterranean, 19TH HOLE delivers an exceedingly pleasurable sailing experience in the most sophisticated of surroundings. Chic interiors onboard charter yacht 19TH HOLE are modern in their design and accentuated by a striking color scheme of bright white, cool graphite, dark ebony, and splashes of gem-toned hues to evoke a sophisticated boutique atmosphere. The bright and airy salon which boasts of panoramic windows, plush furnishings and elegant accents is ideal for entertaining. Posh accommodations designed a rich sumptuous palette of silver and amethyst or cobalt are spacious and beautifully-appointed. With a flexible layout, there is room to sleep up to 10 guests in 2 double cabins and 2 twin convertible to double cabins with upper loft bed, making luxury catamaran 19TH HOLE a perfect charter yacht for friends and families. Guests that appreciate fine outdoor living will find the offerings on 19TH HOLE truly extraordinary. For the ultimate in relaxation, there are plenty of options for lounging in the sun or shade. And for dining, enjoying breakfast on the flybridge complemented by views nothing short of spectacular is an experience to treasure, while savoring an alfresco gourmet dinner under the stars on the aft deck promises to be unforgettable. 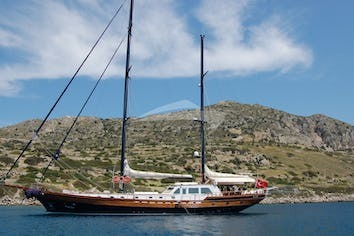 An exquisite charter yacht of the highest caliber 19TH HOLE delivers luxury without compromise and impeccable service that goes above and beyond. 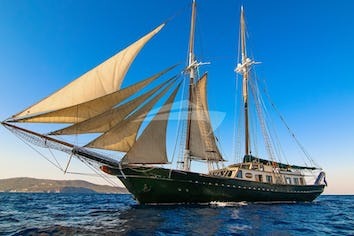 Whether embarking on an idyllic winter getaway in the Caribbean or a luxurious summer retreat in the Mediterranean, this elegant beauty will whisk you away on an enchanting sailing holiday filled with memories that will last a lifetime. 19TH HOLE can accommodate 10 guests in 4 cabins. A master cabin with a double bed, shower and toilet. A VIP cabin with a double bed, shower and toilet. 2 guest cabin with a double bed, a pullman, shower and toilet. 19TH HOLE is fully air conditioned through out.